Advantages: Methodical layout, entertaining read, excellent selection of photographs and diagrams, thought provoking! Some of the most respected aeronautical designers have been intrigued by disc shaped aircraft. The public too has had its far share of fascination, but here it is more in line with the “UFO” (Unidentified Flying Object) aspect of these machines. Despite the title, this book actually takes a broader look at unorthodox aircraft. As well as the general category of man-made flying saucers, it also features other related designs. In addition to the above, “ring wing” ducted fan designs, spacecraft proposals, even VTOL spade and heel shaped fighters are discussed at length. Also not forgotten are the high altitude balloons which have caused many UFO sightings over the years. There are 176 pages in this A4 sized hard cover book. The quality of the gloss stock allows for excellent reproduction of the photographs and illustrations. Of these there are over 440. Both colour and black and white images are presented. These encompass everything from general arrangement drawings, to explanatory sketches of how the propulsion systems work. Others depict the various designs through the ages and where this isn’t possible, clever composite images are created to educate the viewer. Explains these pioneering machines where the first documented designs originated from the 18th century. Much emphasis in this section is placed on Zimmerman’s various “flying pancakes”. A sombre attempt to cover all circular winged aircraft that were developed by the Germans in World War II. The author also tries to sort out fact from fiction; not always an easy task for the serious researcher. A self explanatory chapter which encompasses the many unusual Avro Canada designs. After World War 2, the interest in disc-shaped aircraft grew immensely. Throughout the 50’s, major defence contractors were secretly undertaking or commissioning work in this area. Besides the designs of individuals such as Loedding, Stasinos, and Lippisch, the chapter wouldn’t be complete without a look at Lockheed’s famous Californian “Skunk Works”. The early post war years saw the Western intelligence community worried about the increased sightings of UFOs in the night sky. There was talk of these being visible signs of a new Soviet weapon. The author looks at these events and explains what is known about the Russian flying discs. Lighter-Than-Air vehicles and the UFO connection. Many UFO sightings have been attributed to lighter than air vehicles and these craft are discussed in chapter six. Also featured is the UK’s Channel 4 TV flying saucer hoax which was executed in 2003…a very amusing story! This is where a serious look is taken at the practicalities of such a design. These methods of propulsion come under the spotlight in this penultimate chapter. The pros and cons of the “personal platform” are revealed as well as the larger VTOL designs that used the above forms of thrust. This final episode delves into the extraordinary. Nuclear, beamed, and plasma powered flying saucers are just some of the methods described in getting ones vehicles from A to B. Of course ionic and electrogravitic propulsion can’t be ruled out! The aim of the book has been to highlight the unconventional side of aviation and aerospace aircraft. 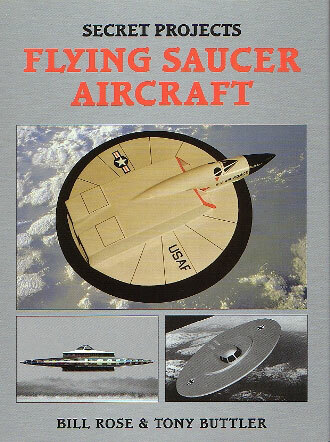 This book succeeds in that aim and the reader is given an excellent grounding in the designs that fall within the general category of “Man-Made Flying Saucers”. It will appeal to those fascinated by the unusual and to all who love conspiracy theories!